Erroll B. Davis, Jr. is Senior Advisor at TalentQuest, a cloud based software talent management and consulting firm in Atlanta, Georgia. Most recently, he served as superintendent of Atlanta Public Schools (APS) from July 2011 until his retirement in June 2014. Prior to joining APS, Erroll served as chancellor of the University System of Georgia, where he was responsible for the state’s 35 public colleges and universities, approximately 302,000 students, 40,200 faculty and staff, and an annual budget of approximately $6.3 billion. Before leading the University System of Georgia, Erroll served as chair of the board of Alliant Energy Corporation – an energy holding company with $8.3 billion in total assets and annual operating revenues of $3 billion at that time – since 2000. Erroll joined Alliant in 1998 as president and chief executive officer. He retired from his dual roles as president and CEO in July 2005, and retained the chair’s post until his move to the University System in early 2006. Prior to the creation of Alliant Energy, Erroll served as president and CEO of WPL Holdings from 1990 to 1998. From 1978 to 1990, he rose through the senior management ranks at Wisconsin Power and Light Company, starting as vice president of finance and ending as CEO and president. Erroll’s higher education experience includes serving as a member of the University of Wisconsin System Board of Regents from 1987 to 1994, and as a former chair and life member of the board of trustees of Carnegie Mellon University. He also, previously, was on the board of the University of Chicago. A native of Pittsburgh, Pa., Erroll earned a bachelor of science in electrical engineering from Carnegie Mellon University in 1965 and an MBA in finance from the University of Chicago in 1967. He is a member of the board of directors of Union Pacific Corp., the Public Broadcasting Service (PBS), and the board of curators for the Georgia Historical Society. He is on the advisory boards of the Institute of Nuclear Power Operations (INPO) and the Atlanta Ballet. He is also a member of the National Academy of Sciences roundtable on community resilience. He is a former member of the board of directors of General Motors, BP plc, Sentry Insurance, PPG Industries and the U.S. Olympic Committee board (2004–2008). He has served on the boards of a number of community-based organizations. He is the recipient of numerous honors and awards, including the 2014 100 Black Men of Atlanta Leadership Award and the 2014 Atlanta Partners for Education Partnership Champion of the Year Award given by the Metro Atlanta Chamber. He was also recognized as one of Georgia Trend magazine’s “100 Most Influential Georgians” in 2007, 2008, 2009, 2010 and 2011; the Atlanta Business Chronicle’s “100 Most Influential Atlantans” in 2006 and 2007; one of the “75 Most Powerful Blacks in Corporate America” in 2005 by Black Enterprise magazine; one of the “Top 50 Blacks in Technology” at the Black Engineer of the Year 2005 Awards Conference; and the Carnegie-Mellon Alumni Distinguished Service Award in 2004. 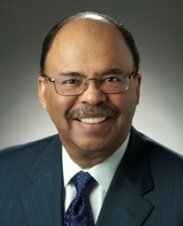 Erroll also was named one of the “50 Most Powerful Black Executives in America” by Fortune magazine in 2002 and received the Distinguished Alumnus Award from the University of Chicago’s Graduate School of Business in 1993, the same year he received the Bronze Medal in Financial World’s “CEO of the Year” competition. In addition, Erroll was honored by the magazine U.S. Black Engineer as the “Black Engineer of the Year” in 1988. Erroll and his wife, Elaine, established the Davis Family Foundation in 1986, which makes annual grants to numerous students in need. Mr. Davis is Chair of the PBS Investment Committee and serves on the Finance, Audit, and National Policy Advisory committees.